Through Sunday night, get a great price on my (and my husband’s) favorite magazine! 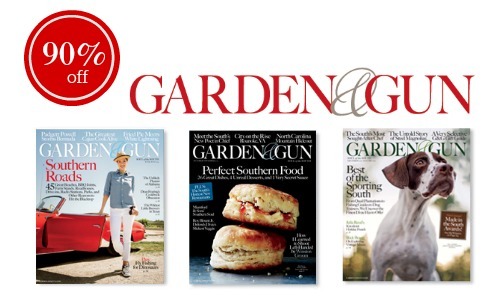 Subscribe to Garden & Gun Magazine for only $4.85 per year (90% off)! You can order up to 2 years at this price! Use code SOUTHERNSAVE to get the discount. Garden & Gun has great articles and recipes plus it’s published in Charleston, SC, so how can you not love it! Click the “give as a gift” button to set this up for someone else or use the deal to renew your current subscription. You’ll even get a printable or email gift card to send! This offer ends Sunday, 12/9 at midnight eastern time.